Amalipe Center for Interethnic Dialogue and Tolerance is a leading Roma organization, working for the equal integration of Roma in Bulgarian Society. The organization plays a central role in organizing a Roma civic movement and advocating for Roma integration within the state institutions. Amalipe is a member of the National Network of Children, the Civil Participation Forum, the National Patient organization, the European Women Lobby. Center Amalipe has its representatives in the Monitoring Committees of the Human Resources Development OP, Education and Science for Smart Growth OP, Regions in Development OP, Good Governance OP and the Partnership Agreement. At present the organozation has Community Develoment Centres and Local community clubs in 15 municipalities and works with a network of more than 260 schools. The key to social inclusion is access to a quality education and social and health services. Effective work with schools, teachers, children and their families will result in a new generation of Roma with higher level of education. Higher level of education will open opportunities for jobs and thus a better quality of life. Increasing the quality of social and healthcare services will assist overcoming the current poor health and social status of the Roma community people. The mission of Amalipe is to stimulate the empowerment of the Roma community and particularly the Romani woman in Bulgaria. The organization will further aim to promote an active participation and equal access to the development processes and resources with a priority focus on access to quality education and healthcare and social services; to overcome the harmful traditional practices in the community and contribute to the empowerment and equal participation of Romani women. To strengthen Roma community self-organization. To increase the participation of Roma (especially Romani women) in the policy making process by developing advocacy skills and joint action practices of Roma organizations. · Currently Amalipe runs nine projects within the sectors of: education, health care, social services and advocacy. Financed by the European Commission, Open Society Institute, Roma Education Fund Bulgarian Ministry of Health. · Amalipe works with a network of 170 schools all over the country. The objective is to decrease the dropout rate of the Roma population, introduce intercultural education, promote life-long learning in the Roma community and raise the educational status of Roma. Essential part of this work is by empowering Roma parents to take part in the school life of their children and converting the school into a center of the community. 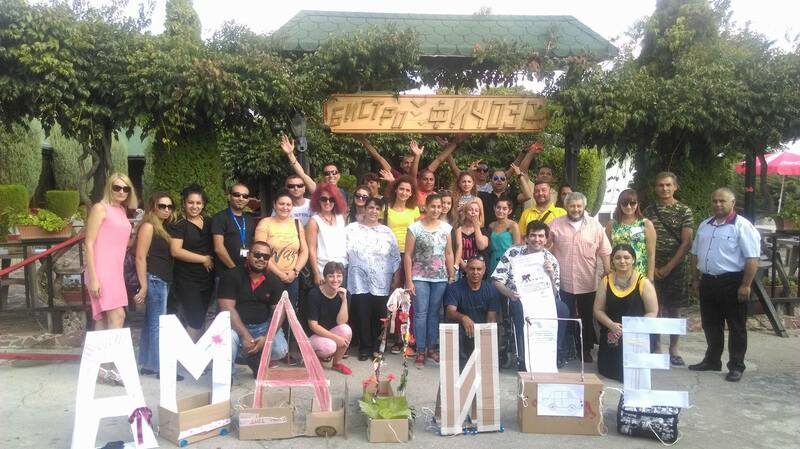 · In order to foster the self-organization of the Roma community, Amalipe has established six Roma Community Support Centers in the six regions of Bulgaria. Everyone of these centers operate with a network of three to six local community groups. · In addition, Amalipe cooperates with grass-root Roma organizations all over the country to organize advocacy campaigns and Roma integration activities in different fields such as: education, health care, social services, etc.